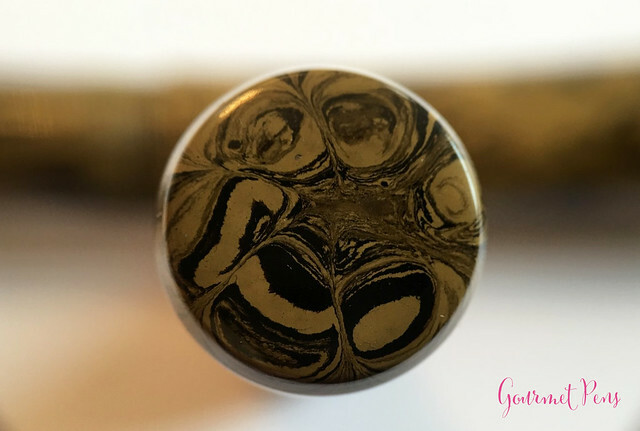 Teri Morris over at Peyton Street Pens sent this over for review - thanks Teri! 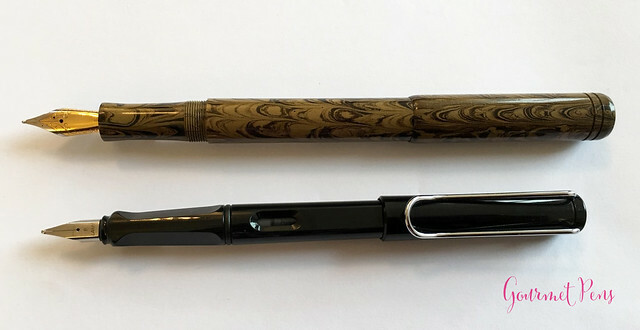 Length (uncapped nib-end): 124.6 mm/4.90"
Section Diameter: 11.2 - 12.3 mm/0.44" - 0.48"
This PSP Ranga Monterey came in a small, simple cardboard box with Peyton Street Pens written on the top. 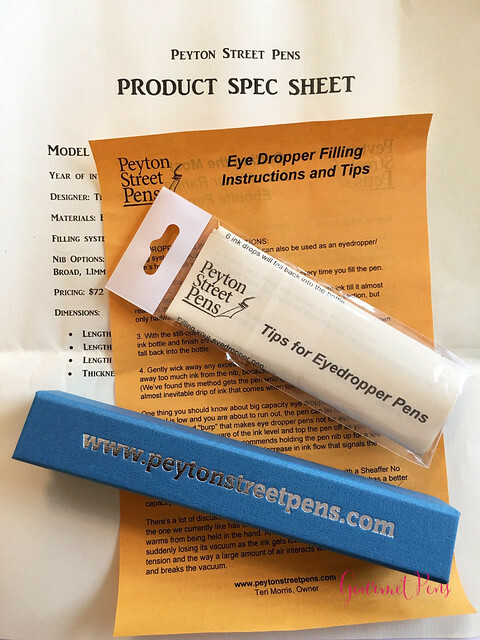 It also came with a converter, a small pipette, a little bit of silicone grease, and a few guides: tips for eyedropper pens, eyedropper filling instructions and tips, getting the most out of your Ranga ebonite pen, and a product spec sheet. Wow. That's a lot of stuff that accompanies such simple packaging. 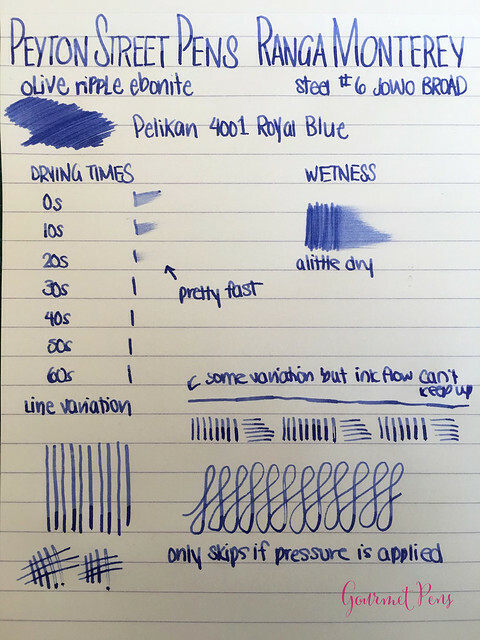 I think that's pretty awesome because a new user, and even a seasoned fountain pen user, might really benefit from all this information! This also sets this pen up as a great gift. 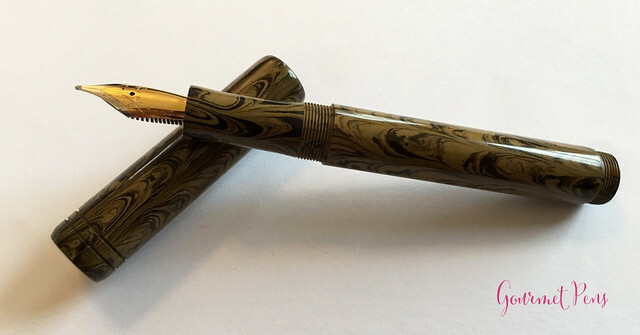 This is a nice looking pen, and although the orange ebonite would have made my heart go pitter patter because it has more pizzazz, the olive ripple is still quite attractive. 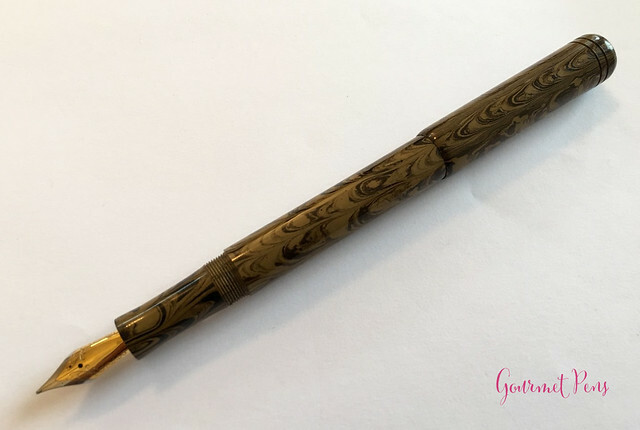 The pen has a round cap, a round body, a threaded, flat, back end, and a smooth, slightly rounded off cap. 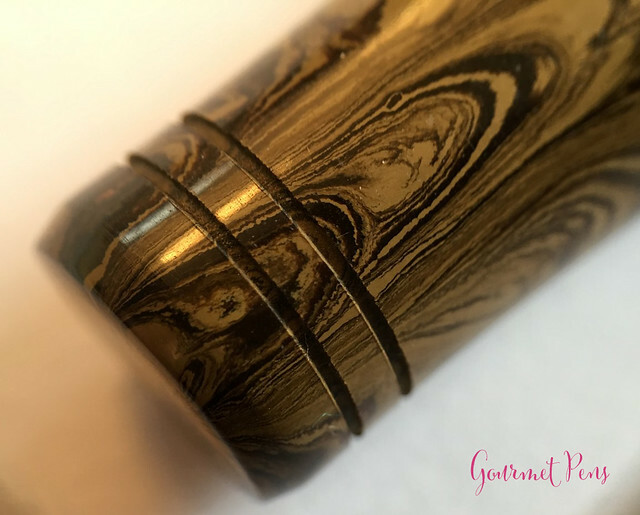 The finial is smooth, polished ebonite. There is no trim on this model. On the cap, near the top, there are two rings engraved into the cap. This engraving is well done and it's very clean, so it looks good. The section is long and round with a bit of an indent. The section threads at the back go right into a small ridge to the barrel. 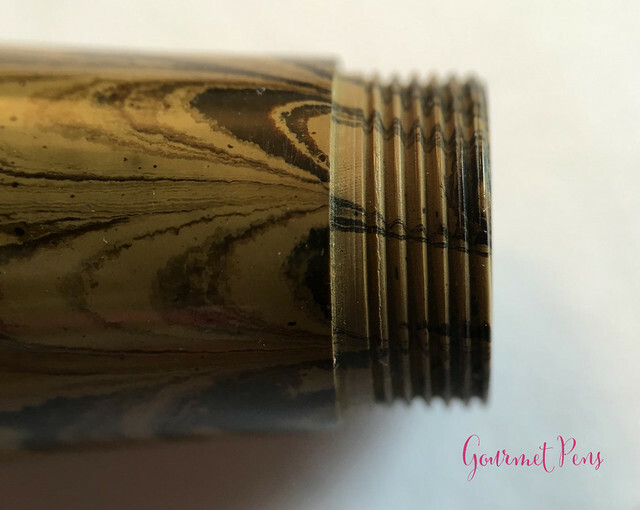 The whole pen is a shiny, polished olive ripple ebonite. 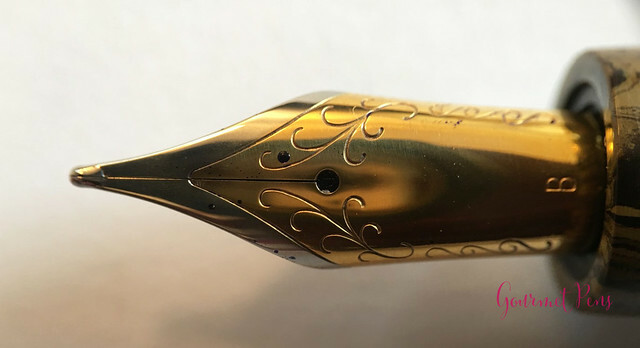 It's a pretty color that doesn't stand out too much, and I like the shape of the pen. Even the 'sharp' edges are not sharp or messy - it's well made and it's attractive. The only thing I don't like about the design of this pen is the threads on the back of the barrel - not that it's poorly done or anything. In fact, as far as slightly recessed threads go, it's one of the better ones I've seen. I don't like how shallow the posting is. Otherwise, I really like the design. Not too long, not too thick, nice smooth edges, decent color. 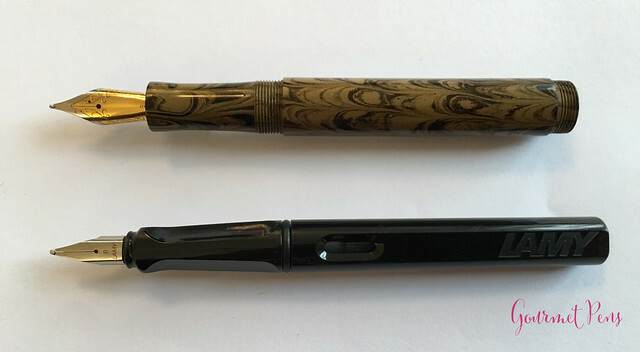 This #6 two-tone steel JoWo nib is not something unusual. It has a single slit and a round breather hole. 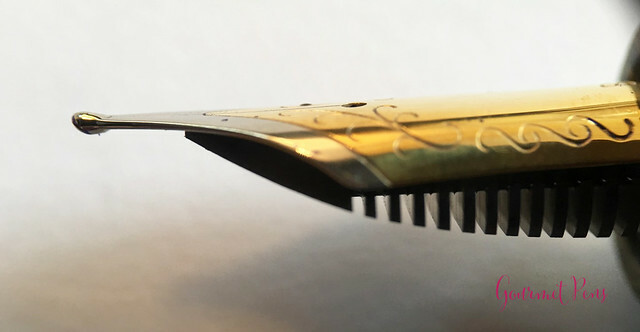 It is engraved with some simple flourishes, and the nib size (B). I find this section exceptionally comfortable - the long, slightly flared shape, smooth edges, very smooth threads - it really works for me. It does not get slippery or slick, and my fingers grip very comfortably. 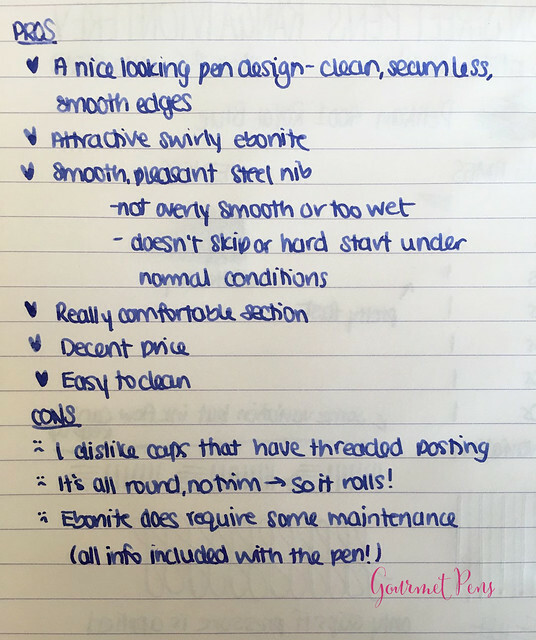 Unposted, the pen is very well balanced, fairly light, and not too wide. It can be posted by threading the cap on to the end of the barrel. This is a secure posting method, but I don't care for it very much - it makes the pen too long for me, and it feels unbalanced. Although I dislike the posting mechanism, it does work well. I did not experience cross threading when trying to post it, and the threads catch each other right away, so I'm not fiddling around trying to post it. 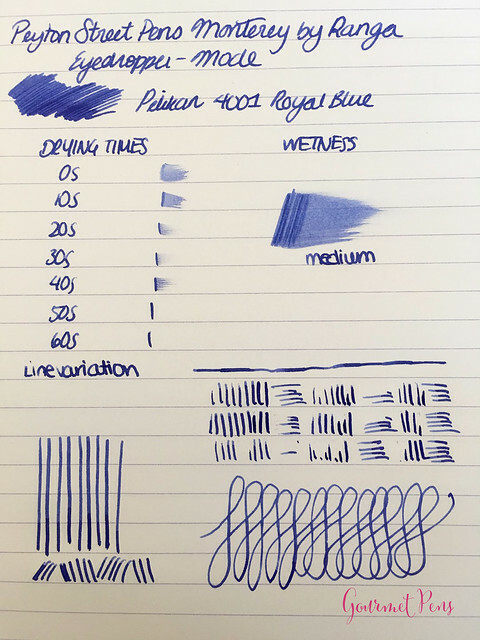 The pen is a comfortable size - it's not an oversize or too small. It is a full size pen capped, and uncapped, but quite long posted. I think Peyton Street Pens have picked a pretty nice pen here. 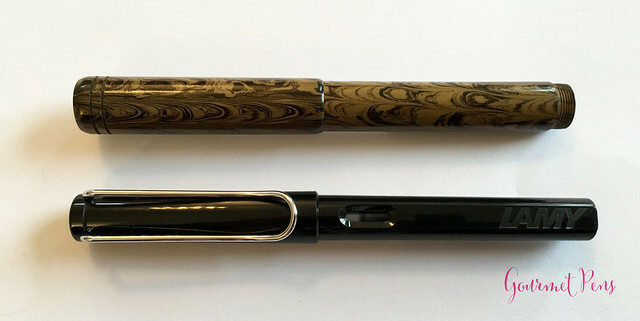 A #6 nib, so easy to swap, and convenient because of that, comfortable pen, a pretty pen, lots of nibs to work with, lots of fun colors to choose from, but a little pricy even though they're handmade (so if you really like it, the price is justifiable I suppose - not for everyone, but for some).